How a Negligent Security Case Works in Wisconsin | Hupy and Abraham, S.C.
Are You Ready to File a Negligent Security Lawsuit in Wisconsin? Pursuing a negligent security case may be unlike anything that you have ever done before. You may be overwhelmed or confused about how to do it and about what steps you need to take to protect your rights. Our personal injury lawyers have decades of experience helping thousands of clients get the recoveries that they deserve. We would be pleased to offer a free consultation about your rights and to talk to you directly about your potential recovery, but first we want to provide you with some free information about how negligent security lawsuits work in Wisconsin. Why you should pursue a civil negligent security lawsuit if a crime was committed. The state of Wisconsin may pursue a criminal case against the person who hurt you. That criminal case may end in jail time and other consequences for your attacker. However, it will not compensate you for your injuries. While you may have a civil personal injury case against your attacker, your attacker may not have the money to pay for your damages. The property owner, however, may have the funds or the insurance necessary to compensate you for your injuries. How to collect evidence for a negligent security case. In order for your negligent security claim to be successful, you will need to prove that the property owner failed to provide you with reasonable security. To do this, you will need proof. This may include photographs, surveillance videos, and documentation about security guard or employee training. How long you have to file a case. The Wisconsin Statute of Limitations generally provides you with three years to file a lawsuit. However, there are exceptions to this general rule. Specifically, the amount of time that you have to file a claim may be shorter if the property owner is a government entity, or it may be longer if you were hurt while you were a minor or mentally incompetent. Whether you have standing—the legal right to sue. 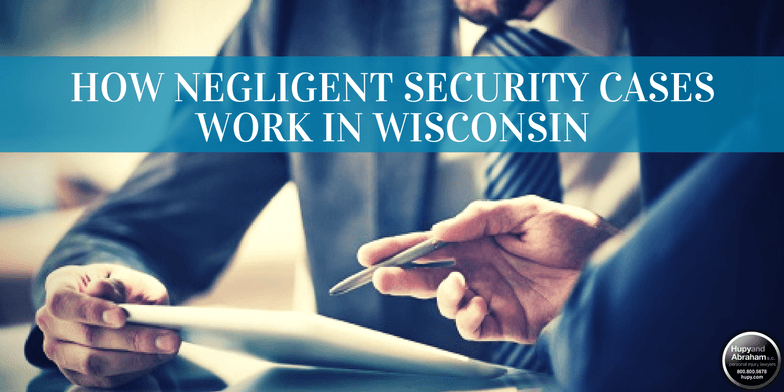 If you were hurt in a negligent security incident, then you have standing to sue for damages in Wisconsin. There are other situations where you may also have standing to bring a lawsuit. For example, you may be able to bring a case if you are the parent or guardian of a minor child or if you are the executor of the estate of someone who died because of negligent security. Whether expert witnesses may help your claim. Expert witnesses may have an important part to play in your recovery. A security expert, for example, can help determine whether the security provided by the property owner was reasonable given the location and use of the property. A doctor can explain the likely effect of your injuries on your future, and an economist may explain how your injuries will impact your future income. Whether you need an attorney. Negligent security cases are complicated and an attorney can take the stress of such a claim off of your shoulders and provide you with the confidence of skilled advocacy in pursuing a fair and full recovery. How settlements work. Settlements require negotiation. Insurance adjusters are professionals and work on settlements every day. Your attorney is also a professional who can look out for your rights and help you get the fair recovery that you deserve. How to start your case. A negligent security case starts when a complaint, summons, and filing fee are filed with the court. Settlement negotiations may occur prior to the complaint being filed, but they do not formally begin a negligent security case. Your negligent security case doesn’t end once your complaint is filed. Instead, it is just beginning. Once the complaint has been filed and the defendant has been served, you can expect the defendant to file a formal answer. Then both you and the defendant will participate in legal discovery and pre-trial motions. Every step of the process is important to your fair recovery. You have the right to work with an attorney. If you would like to schedule a free, no-obligation consultation with an experienced lawyer then please start a live chat with us or call us directly at 1-800-800-5678 today.